I'll be posting updates and stuff for my map projects. At some points of progress I'll post my maps in groups. My map projects are placed in alphabetical order. Description: Easy to draw as terrain repeats many times. I could just copy and paste. Description: Screenshots of panorama sections and white lines showing where to walk. Original counterparts of the maps accompany them for clarification. Description: An extremely technical map procedure is used for this project. It's a miracle that this game can be mapped with these tricks. It's also a big project with huge maps. Description: A rather easy project with its LoZ-style room views, but the tower segments are hard. Description: Ripping a 3D game! Using the game's textures, Dragon Unpacker, and a tiled map image creator called Tiled to replicate maps. Maps are made up of 2D tiles with 3D rendered models. Ooo, a Spyro game. Can't wait to see that. But wait "I get my wii hooked up to my laptop"?! What is this capture device program? I'm using an EasyCap and Ulead Video Studio to get my Wii running on my laptop screen. Update: I have my Wii good to go for the Spyro's Adventure project. I'll start whenever I'm ready. And for THPS, I'm still doing the second of the nine maps because it's quite a big one. I will send three maps in the project at a time. To see how I draw my original maps, click here. This is an early version of the first map in THPS. The font is hard to read but I fixed that in the final version. Well after hiatus due to other things taking over, I finally got to starting the Spyro's Adventure project. I already have one map done which took HOURS to make. But that's okay, I had to get used to the SSA map making routine. I also was making many small images as legend stuff. I'll upload the first four maps to the atlas once I finish the fourth one. This is how this map project is going to work: There are 22 story maps at regular length. There are four extra story maps which can be played by placing adventure toys on the portal. There are 32 "heroic challenge" maps which are unlockable by adding new skylanders to the collection. The heroic challenges should be very easy because they use maps from the story chapters. Also, there are a few short battle arena maps which I didn't see yet. I don't know the correct number of maps since I didn't see the battle arenas, but there will be over 60. The original 22 story maps I can do, but the four adventure toy chapters I can't seem to do because I don't have any of the adventure toys. As for heroic challenges, I only have 14 of the 32 Spyro's Adventure skylanders so I can do 14 heroic challenge maps. However, it may not be impossible to do the maps with insufficient requirments. I can always work on maps from a walkthrough video, but there are a few chances it may be harder to draw the map. So you won't be seeing them for a few months or more. Anyway, to replace the Spyro's Adventure project for now, I'm going to come back to my nearly-two-year-old Speedy Eggbert project. I'm going to start over because the maps look a bit weird, with ugly numbered squares and overlapping piles of blocks. I had those overlapping blocks because the way it was designed had space and I wanted to try and make it better. But this time I'm going to rip maps so that they appear as the exact design from the editor. Also remove all numbered squares and instead make path lines on the maps showing where moving objects move. Levels have four different map types: Large (100x100 tiles), Horizontal (100x7.5), Vertical (10x100), and Tiny (10x7.5). When ripping maps, any useless space that is adjacent to the whole map's edges will be removed. I also forgot to mention that the name "Speedy Eggbert" is the alternate name for "Speedy Blupi" which is the original game's name. It was called Blupi when the game was released but then its game publisher "eGames" renamed it to Eggbert for some reason. I just call it Eggbert because most players use that name alot. As for mapping, I've added legends to the maps now so that everyone knows whats going on. The Speedy Eggbert link is up. Check the first post. It should've been up a week ago but I had problems with the map size since most of the maps are huge. Now there will be new maps posted every few days since I made more than twenty at this point. I'm making really good progress here. 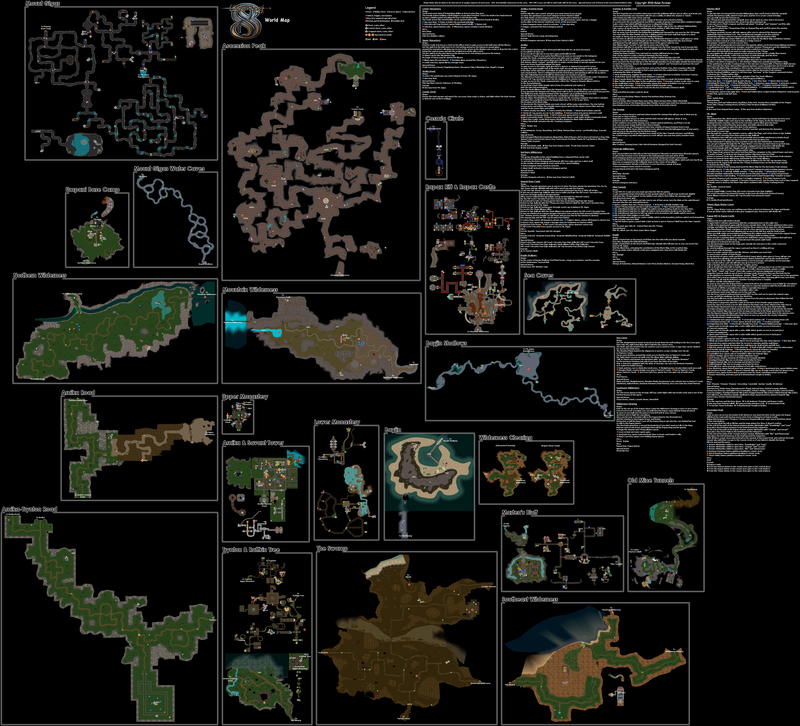 Well after a few weeks, I've finally finished mapping all the Single Player maps of Speedy Eggbert. The final level was really huge as it took me about four hours to rip. All the hard stuff about this map project is cleared off. Now I'll just relax on mapping the smaller 10 multiplayer maps and the 7 unplayable demo maps. I should have the project finished in under a week. I've just finished the last multiplayer map. Based on how the unplayable demos maps were designed, I'm not going to do them. So I guess that's it for the project. I'm done! I forgot to mention how I mapped Speedy Eggbert. It's really complex. To start mapping the game, it all works with the game's level editor. But all the regular levels were inaccessible to edit from the level editor. A long time ago I discovered this hack to edit the hubs and levels to make my own Speedy Eggbert game. It all works with hacking a save file by typing random characters on notepad. Now that I can access the levels with the hack, I need to get rid of anything that is not necessary for mapping. They are the backgrounds since they have depth, the editor buttons, and a few annoying block sprites. Once all that is cleared off, I start mapping. I take screenshots of every area of the map. Many maps have large unnecessary space and that's why they are replaced with black space on the end result. Once screenshots have been attached to show an entire map on MS Paint, I then apply the background by retrieving the background sprite from a game file, tiling it so that it's the same size than the map, and copy-paste the map onto the tiled background. While mapping. The background of all screenshots are one solid color and the whole map is set to transparent when adding the background. Once that's done, I've finished the map. And this is going to be the most technical map process I will ever do. And it's not over yet. I'm going to start mapping Speedy Eggbert 2 after a while! Since I'm a bit tired of Speedy Eggbert mapping right now, I'm not going to do Speedy Eggbert 2 yet. Instead I'll have a new, much more easier, project. It's a project for yet another PC game "The Crystal Key". This game is an exploration one that is all created with panoramic views and videos. There is a panoramic view for each spot of the world and clicking on a hotspot plays a video of first-person walking to another part of the area which, when ended, brings up another panorama. I've decided to cancel the Tony Hawk's Pro Skater map project because it's not a ripped one and drawing the maps according to my sample will be harder than I think. I also haven't been working on it for months because I didn't find it quite fun. So goodbye. And a Crystal Key update: A few days ago I was thinking that the ripped maps may be a bit confusing. So I'm going to draw original versions of the maps to go with them. I'm doing this for clarification. So that means the number of maps has been doubled for the project. I've finished the map project for The Crystal Key a few days ago. They should be up in a few days. Yes, it's another PC game For this project, I'm going to perform another technicality, but not as big as Speedy Eggbert. The project is going to be a ripped one and the game IS 3D. So how am I going to do this? Well It's a bit like Peardian's trick to mapping 3D games (I love his maps BTW). The game is made up of 2D tiles which render 3D models when loaded. I use two programs called Dragon Unpacker, used to collect files from game .dat files, and Tiled, an image creator of tiled maps. I first gather the game's textures with Dragon Unpacker and once I have the textures for the map, I open Tiled and replicate the maps with the ripped textures as the tileset. For the 3D models on the map, they could be a bit tricky. I gather the textures of the models and then edit them with an image editor so that they appear as if the model is in top view. And if this project wasn't enough. I can also map Wonderland's other two games after - Return to Wonderland and Wonderland Secret Worlds. Both have many more maps than Wonderland! Added the list of my planned projects to do in the future. Take a look! If somebody else has some games on my list as their map projects before me, I'll remove those games from my list. So many Wii games. You're quite ambitious.